I have shorted the Canadian Dollar. Entry occurred at 12:50 (my time, as always), at 1.0140. I was primarily watching gold, the USDX, and sugar, but I saw this chart setting up and I just decided to act. Lately, I've been trying to focus on only the USDX and sugar, and then recently gold again, but I decided to try and trade this setup anyways. So here is the breakdown for my currency futures trade in the CAD/USD. First, let us observer the weekly futures chart for September CAD futures. Notice how we are in a range that has encountered upside resistance in the recent past. This, in addition to some other fundamental indicators I use that do not show up in this chart, are telling me that prices for this currency futures product could swing downwards soon. That makes me peel my eyes on the daily and 60 minute charts for possible entry points on the short side. Next, let us observe the daily futures trading chart for the same currency futures product, CAD. Here we can see more closely how prices have encountered upside resistance in the 1.0150 to 1.0160 range over the paste few weeks. 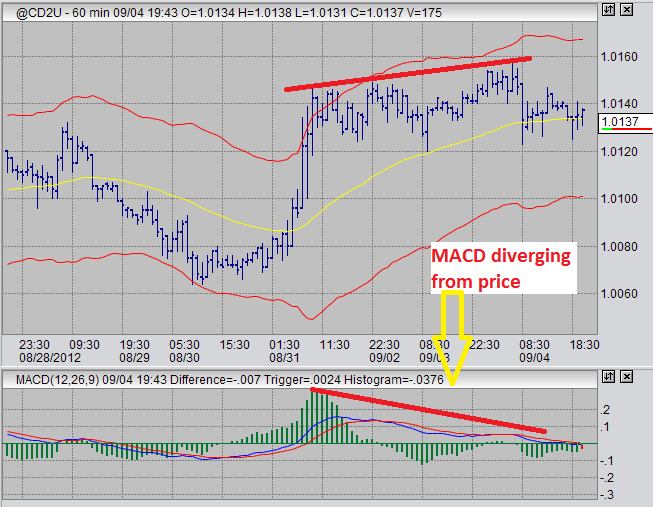 Also, notice that as prices have been poking upwards, MACD has diverged downwards. To me, this is an MACD divergence, and I am willing to trade it as such. I am open to the possibility that my analysis is wrong, and that is why I use stops, as you should. 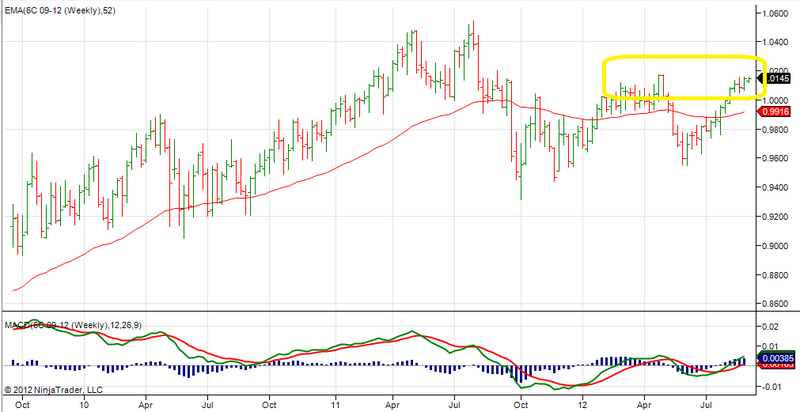 After observing the weekly chart, this situation in the daily timeframe is telling me the time is pretty close to "now". Let us now observe the 60 minute futures chart for September CAD/USD futures. Here we see another picture where MACD is diverging with price. On this time frame, this is a call to action. I have entered my trade after prices fell a little from the top. My entry was at 1.0140. Again, if my analysis has proven faulty or if market conditions change, as the frequently do, I have a stop in place in case of a runaway upward movement. This is how I use the three time frames to decide on trades. In markets other than the Canadian Dollar, I'm still bullish on Gold, USDX, and sugar. However, I'm still waiting for a setup that I like in the USDX and sugar. In gold, I'm hoping prices will correct to my weekly moving average, and I am hoping for an entry in the 1620 to 1600 range maybe in two to four weeks. As you have noticed, I am currently using two different online trading platforms for my analysis and trade execution. I am trading from firetip, and using it for my 60 minute and daily analysis. For my weekly and some daily analysis, I am using ninja trader. If you have any comments about this, please use the contact us link below to send a comment.